Peacefully, on Saturday, December 1, 2018 at Summit Place, Owen Sound in her 90th year. Alma, loving wife of the late Earl Johnson. Proud mother of Douglas (Tina), Stephen, and Terri Morrison (Brian) all of Owen Sound. 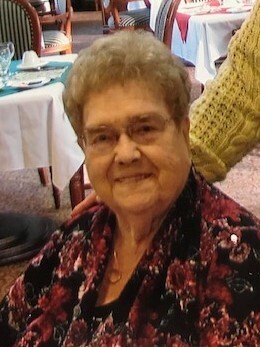 She will be greatly missed by her grandchildren Robert (Shelley), Jeff (Michelle), and Shelley; and her great grandchildren Brent, Lynden, Joshua, Hayley and Caleb. Dear sister of Helen and sister-in-law of Lynda (David Mezzell) and Mildred (Allan Johnson). Predeceased by her parents Francis and Margaret Bravener, her siblings Howard (Kay), Harold (Glad), Olive (Earl Moulton), William (Florence), Claire (Shirley), and by her brother-in-law William Iles. Friends will be received on Wednesday, December 5th, 2018 from 2-4 and 7-9pm at the Breckenridge-Ashcroft Funeral Home, 241 9th Street West, Owen Sound, 519-376-2326. A funeral service will be held at 2:00pm on Thursday, December 6th, 2018 at the Salvation Army Community Church, 365 14th Street West, Owen Sound. Interment Greenwood Cemetery. Memorial donations to the Salvation Army Community Church, Summit Place or a charity of your choice would be appreciated by the family.